Well, I missed wishing you a Merry Christmas – so I hope you had a lovely Christmas! But, on time, I do wish you a Happy New Year! I hope you have a super night, fulfil every New Year resolution and have a safe and happy New Year. 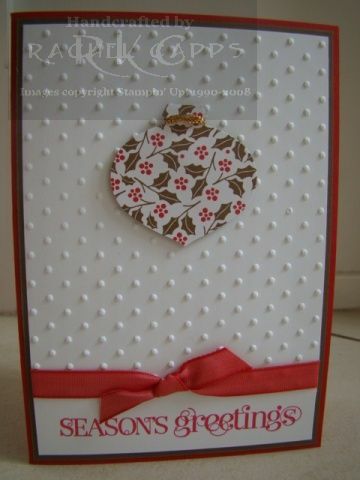 I used the Cocoa Specialty DSP (not available now) together with Real Red textured cardstock and Soft Suede and Real Red cardstock. 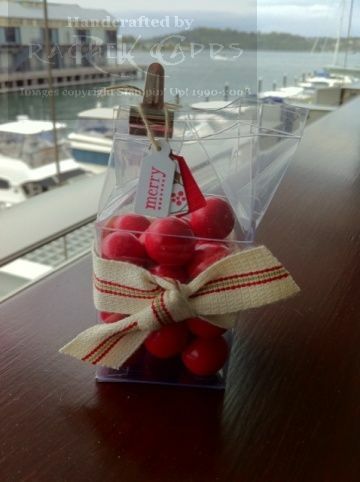 I love this colour combo – Real Red, Whisper White and Crumb Cake. 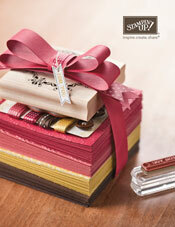 And I love the contrast between SU’s gorgeous White Satin ribbon and the hemp twine. 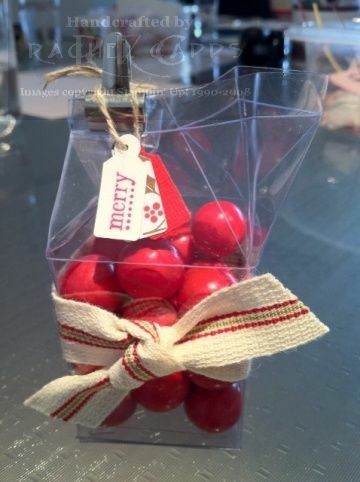 The Delightful Decorations stamp set and Ornament punch have made awesome Christmas gift tags for me this year – couldn’t have done without them. And the Mini Milk Carton Bigz L Die and my Big Shot are indispensibe. Aren’t those cartons adorable? This is a quick gift card holder I made up last night for my Godson’s Christmas present. Inside there is a JB Hi-Fi voucher which is still in its own folder, so the gift card holder is slightly bigger than a standard gift card size. 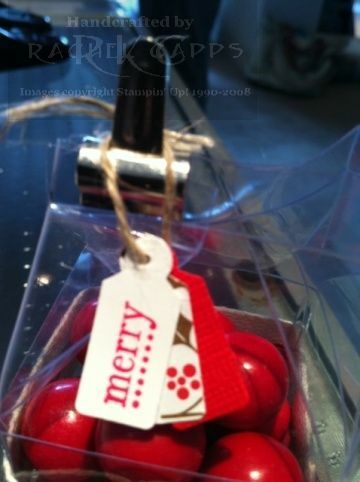 I was inspired to make this from the gorgeous Secret Santa gift I received from my Stampin’ Up! buddy, Rachel Jackson. You can see her gorgeous gift for me here. I loved the black and red spots together. 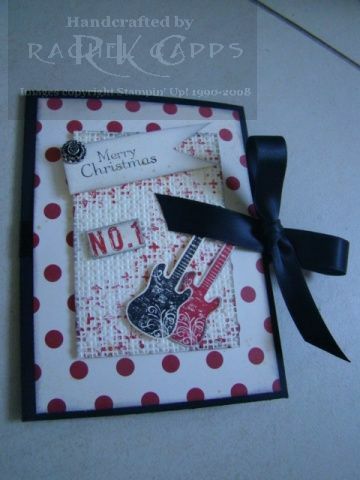 And, as this is for a boy, I had to use the super new stamp set, available in the Summer Mini, Grunge Rock. I used part of the sentiment from the Level 3 Hostess stamp set, Occasional Quotes, and I popped a more masculine background pattern in by using my Big Shot with the Square Lattice Textured Impressions Embossing Folder. 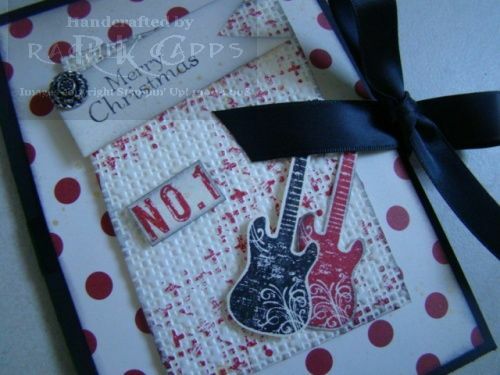 I stuck to the colours Basic Black, Real Red and Very Vanilla, and I added some depth to the gift card holder by sponging Basic Black around the edges, including the Real Red guitar. I popped a Vintage brad in the corner near the Merry Christmas and snipped a flag end with my paper snips. I finished off by using my new Gold Glow Smooch Spritz over everything – I love this new effect! I was extra fortunate a few weekends ago to do a workshop on Sydney’s harbour. Well, not actually on the harbour, as we weren’t in a boat, but it was at one of the apartments on the piers, so we were definitely over water. Check out the view behind this cute milk carton! I was pretty impressed. And even more impressed by my amazing hostess. 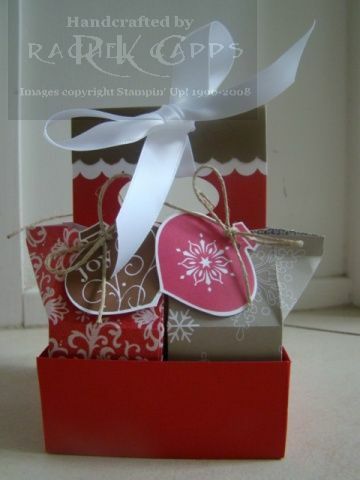 I demonstrated this cute little box made with acetate and then gave it to my hostess. I’d brought along the jaffas, because I’d had this idea stuck in my head that had to get out – a clear milk carton with jaffas inside! Don’t you get ideas like that? 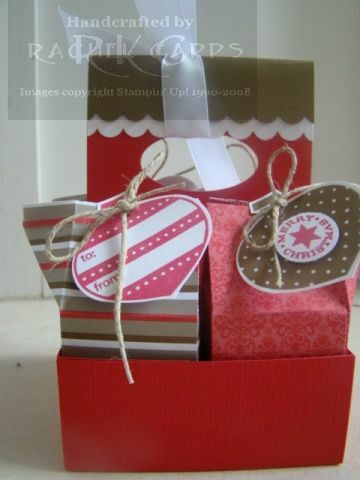 The box, of course, is made with the Mini Milk Carton die and the Big Shot. 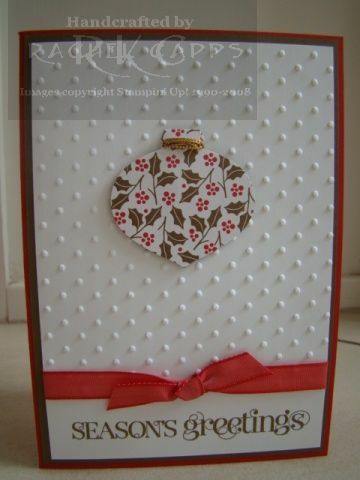 The sentiment was stamped from Tiny Tags, and I layered it with two more tags punched from Real Red textured cardstock and the Cocoa Specialty DSP (now not available). The SU ribbon also isn’t available any longer. Now, I took these photos at the workshop before my hostess kindly offered for me to try the balcony for better light, lol! Of course, the photos above have far more than better light!! 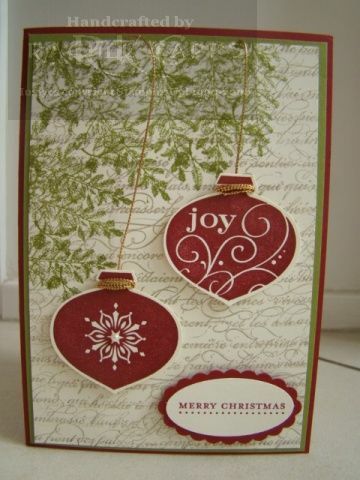 Here are a few more quick Christmas cards. 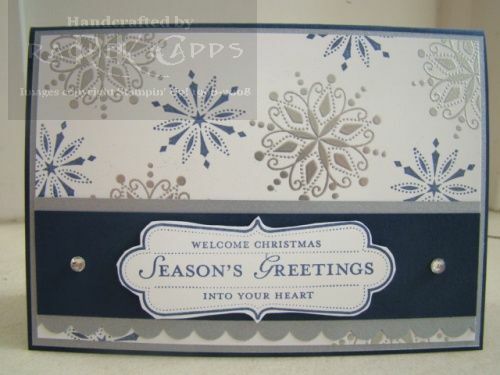 I really love the Curly Cute “Season’s Greetting” stamp, so I’ve made quite a few cards with it this year. 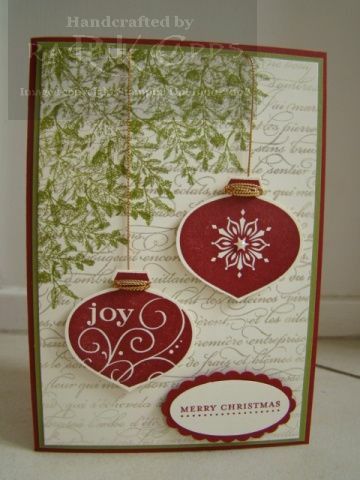 For the card above, I punched out some Cocoa Specialty DSP (not available anymore) using the Ornament Punch. I wrapped some gold cord (retired) around the top and then stuck it to some Whisper White paper that I had embossed with the Perfect Polka Dots embossing folder and my Big Shot. 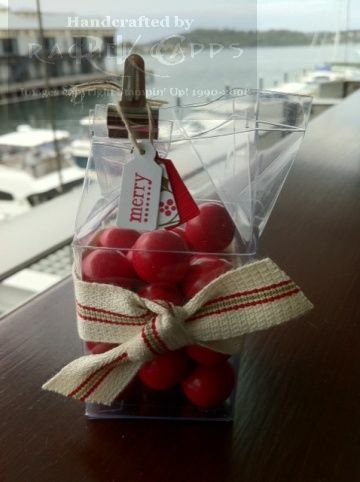 The sentiment was stamped in Real Red. This card is slightly different. 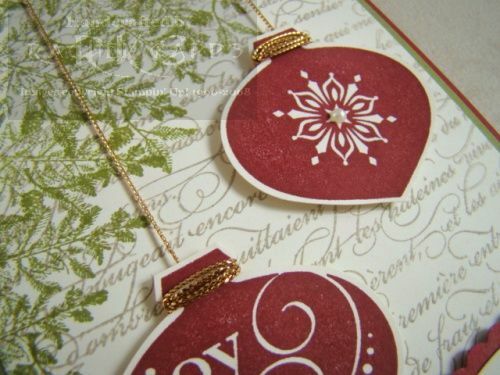 It has three ornaments and the sentiment was stamped in Soft Suede ink. 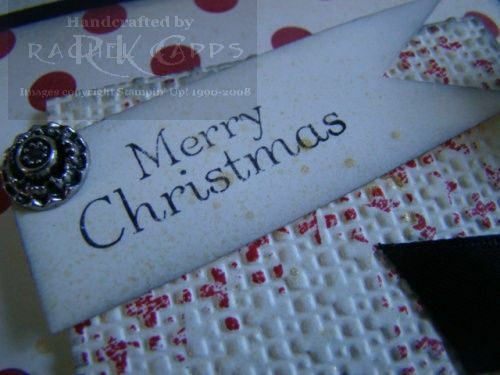 This card is the same as the first card, except the sentiment is stamped in Soft Suede ink. I used the colours Night of Navy and Silver. The silver snow swirls are heat embossed with silver embossing powder, and I’ve added some rhinestone brads to sparkle things up. I’ve got to have bling, especially at Christmas, lol! 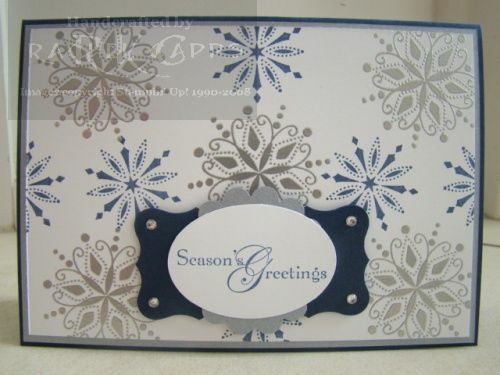 I really loved this stamp set, the snow flakes embossed so perfectly. Lovely! Here is one of my favourite Christmas cards that I’ve made this year. I just love it! And, you know, the sentiment is from the stamp set Teeny Tiny Sentiments. I use Teeny Tiny Sentiments ALL THE TIME! And it’s on special this month – from $62.95 to ONLY $31.48. That is an incredible price!!! Check out what else is on special by checking out the details below or clicking on the December Frenzy picture to the right. 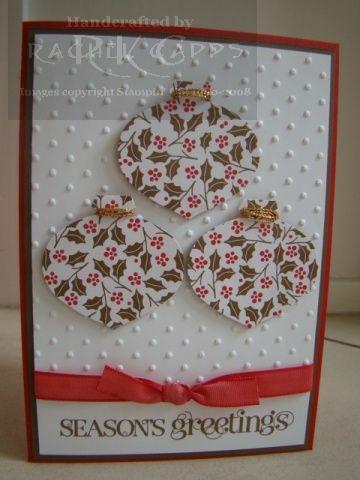 I’ve also used the stamp sets En Francais (background), Delightful Decorations and Lovely as a Tree. 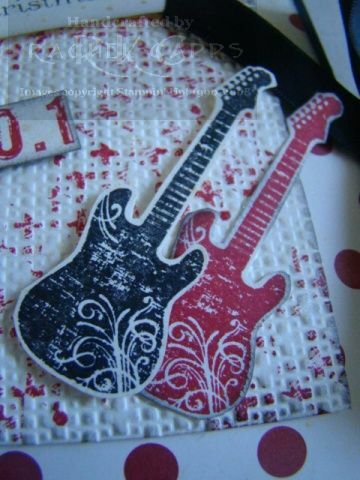 The En Francais was stamped in Crumb Cake, the ornaments are in Cherry Cobbler and the trees in Old Olive. Wow. 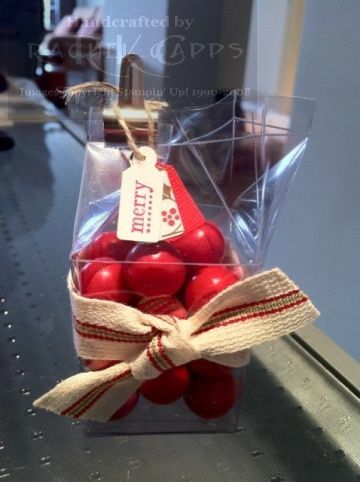 This is a super colour combo for Christmas, don’t you think? Now, you can’t see too well in my photos, but I’ve also sponged Champagne Shimmer paint all over the card and it looks GORGEOUS!! lol! Now, the December Frenzy special runs all December, so now is the time to order up any last minute Christmas gifts. And at this amazing prices, how could you not?!! Contact me to place your order today!